Since antiquity the epic has been the defining poetic and musical genre of southeastern Europe. Performed by specialist singers, usually accompanying themselves on stringed instruments, Balkan epics unfold narratively and with single lines, often over the course of hours or even days, requiring great feats of memory and creativity. Stories and histories converge in the Balkan epic, defining moments of conflict between empires and religions in the Middle Ages and nation-states in the present. Balkan epics are both classic works of literature and song in the southeastern European tradition and a form of political commentary and cultural expression in the modern Balkans. 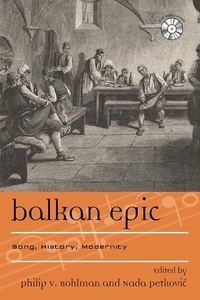 In Balkan Epic: Song, History, Modernity, editors Philip V. Bohlman and Nada Petkovic have compiled essays that examine epics across the Balkan region and in the major languages of the different nations. Individual authors explore the epics of Albania, Bosnia-Herzegovina, Croatia, Montenegro, Romania, and Serbia. Emphasizing the ways epics can symbolize the Balkans as a whole, they consider the contributions of individuals over the course of the historical longue durée and in the last decade. On the accompanying CD of recordings--some never heard before--these stories and histories come to life. Themes of conflict and reconciliation form a counterpoint, revealing the ways in which the epic sheds light on the aesthetic and political complexities of southeastern Europe today. Balkan Epic brings together diverse perspectives on the many repertories of epic song in southeastern Europe. Students and scholars in the fields of music, anthropology, history, linguistics, Slavic languages, media studies, and political science will benefit from the interdisciplinary thrust of the collected essays.